Lexar Media outs a new multi-format memory card reader, which have five slots and supporting 24 types memory cards. The Multi-Card 24-in-1 USB Reader has a pop-up design and enables concurrent downloads and card-to-card file transfer. 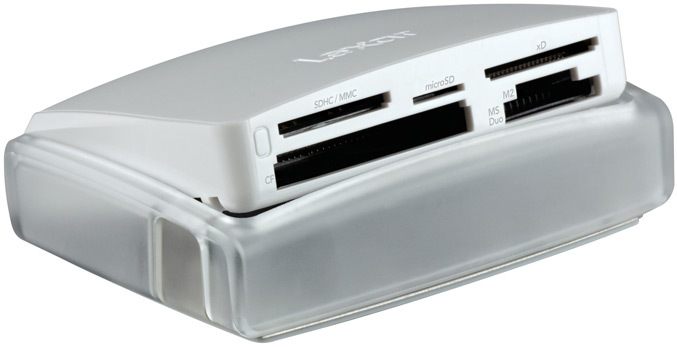 Lexar Multi-Card 24-in-1 USB Reader and comes equipped with a Hi-Speed USB 2.0 cable. The reader makes it easy to quickly download photo, video, music, and other files from nearly any memory card to a host computer. It is s available now, priced at $29.99.